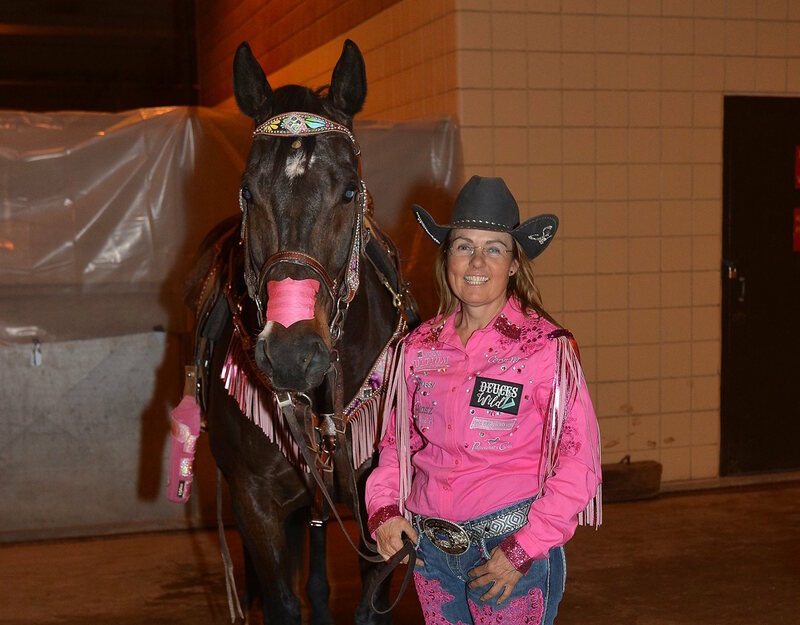 Michele McLeod and Apt To Be Special at the 2017 Fort Worth Stock Show Rodeo. Photo by Kenneth Springer. The combined knowledge of master bit and spur maker Greg Darnall and multiple National Finals Rodeo qualifier and futurity champion Michele McLeod is immense—so much so that the two teamed up to design a line of bits specifically designed to address many of the common issues riders face with barrel horses. Drawing on McLeod’s years of barrel racing experience training, competing and teaching clinics, Darnall used his expertise and craftsmanship to create bits to help barrel racers achieve a balanced horse and get the desired response from their hands. And, in contrast to most popular bits used in barrel racing, McLeod’s new Greg Darnall bits are not gag bits. Barrel Horse News visited with McLeod about bits, horsemanship and how they intertwine in training. Be sure to pick up a copy of the May 2019 issue of BHN for a detailed profile on one of McLeod’s favorite new bits in her Greg Darnall line. BHN: How did you and Greg decide on what you wanted this line of bits to be like? McLeod: “I’m not a bit expert, nor have I ever been, and I laugh because people always ask me ‘What bit?’ and I’m the one who rides every horse in the same bridle. Now that I’m done rodeoing and back training horses, I’m realizing it is truly the people’s hands that matter. What works for me is not going to necessarily work for the majority of other people. I’ve tried to realize that and figure out what can be accommodated. BHN: Can you explain the effect of a gag bit? BHN: On the contrary, what is the response with a more immediate-response bit that has no gag? A self-proclaimed hackamore person, Michele McLeod runs Slick By Design at the 2016 National Finals Rodeo in the long-shank ‘Slick hackamore.’ Photo by Kenneth Springer. BHN: Do you switch bridles a lot when training at home? McLeod: “I switch around bridles depending on the horse. If I get a horse in for me to tune on and they’re really pushing or lugging on the bridle, I’m going to go to a little more severe bridle or a longer shank—if the horse is heavy, not responding to my legs, not responding to my body, they’re getting pushy in the bridle. I’ll go to a longer shank and try to get them softer, then move back into a shorter shank. BHN: Do you train and compete in different bridles? BHN: Do you use other headgear, like tie-downs, bonnets, martingales? BHN: When selecting a bit, what are some general qualities to look for?